Youth Emergency Services and Shelter (YESS) is our second featured Des Moines finalist in the 100 Year, $100k Office Makeover Contest. Founded in 1973 as the Iowa Runaway Service drop-in center at the downtown Des Moines YMCA, YESS services meet the ever-growing need of Iowa’s at-risk children and their families. YESS offers emergency shelter, crisis nursery care, counseling and case management services, and family stabilization and assessment. To vote for the Des Moines winner of the office makeover contest, click here! A: YESS serves kids and families by providing vital resources and support to keep kids safe and families together. The agency does this through emergency shelter and community services. In the past six years, YESS has experienced exponential growth, doubling its annual operating budget and number of employees due to increased clients served. 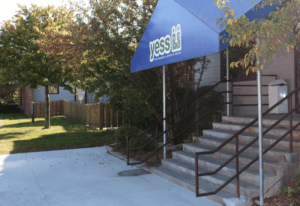 With limited space, YESS uses existing space in creative ways, including building offices in repurposed areas and furnishing spaces with donated supplies. A: As a part of the agency’s national accreditation, YESS strives to not only meet but exceed all performance evaluation, quality improvement, and ethical standards set forth by the Council on Accreditation (COA). In accordance with COA best practice, YESS utilizes a formal Performance Quality Improvement program designed to promote excellence and continuous progress in all aspects of client care and wraparound services. This analysis of every organizational element, from service provision to ethical standards, financial stewardship, outcome monitoring, facility management, human resources, and governance, creates a top-to-bottom culture of integrity, openness, transparency and accountability. YESS also conducts ongoing evaluations of all agency programs by collecting data to determine the effectiveness of service delivery. This data collection goes beyond the number of meals served or nights of care provided to determine how children and their families are “better off” after receiving services from YESS through changes in knowledge, attitudes and behaviors. A: YESS provides a safety net of wraparound programs designed to help kids and families when they need it most. As Iowa’s largest provider for emergency services for kids, the agency connects more than 2,000 children per year with healing and hope. Whether providing safety for 800+ kids per year in the agency’s emergency shelter or working with 1,000+ kids per year to help them stay safe in their own homes, YESS works to make a difference in the lives of our community’s most vulnerable kids in order to give them hope for a brighter tomorrow. YESS does this by helping kids begin to heal from previous trauma while learning positive coping skills for their futures. Further, the agency walks alongside children and their families to provide support and advocacy to navigate life’s challenges. In the latest fiscal year (ending June 30, 2017), YESS was able to provide 3,329 counseling sessions, work with 1,300 families in our coordinated care program, and provide 16,975 nights of shelter care to kids in need of emergency shelter. Through this care, YESS helped 65% of clients improve or maintain their trauma symptoms, diverted 431 shelter youth from a costly higher level of care, and enabled 89% of shelter kids to improve their overall functioning while staying at YESS. A: YESS’s unique combination of comprehensive services does not exist elsewhere in Iowa, allowing the agency to uniquely serve the community’s most vulnerable and at-risk children. The safety net of emergency and wraparound services meet children and families where they are and provide care when they need it most. An alarming trend impacting YESS’s work is the growing needs of our community’s children due to increased complexity and severity of their issues and past traumas they experience which result in increased behavioral and mental health needs. Because of the ever-increasing level of children’s needs, YESS has continued to become more specialized in its counseling and mental health therapy services, using nontraditional, expressive therapy (art, music, and play) whenever possible. YESS is acknowledged and praised throughout the child welfare system for its willingness and ability to serve children others will not, especially those seen as “more difficult” due to the severity of their challenges. This willingness to help all children in need of a safe haven has resulted in an unprecedented need for agency services. In the last fiscal year (ending June 30, 2017), the agency saw a nearly 10% increase in nights of care and 8% increase in shelter admissions. YESS expects to serve even more children in the current fiscal year. 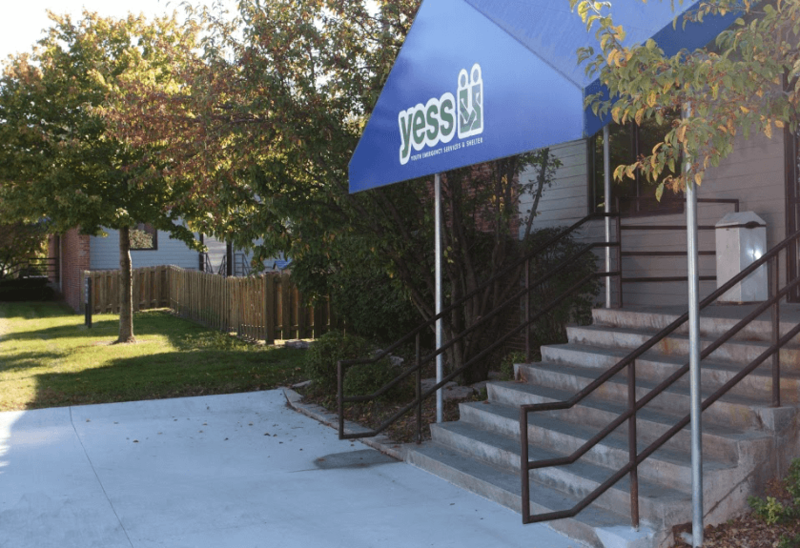 To meet the growing needs, YESS opened an additional living unit (10 beds) in July 2017.